Newton Chicken : Can't cluck, can't fly, and can't lay eggs, but you can carry it across the road in your pocket! NT Chicken : Will cross the road in June. No, August. September for sure. OS/2 Chicken : It crossed the road in style years ago, but it was so quiet that nobody noticed. Win 95 Chicken : You see different colored feathers while it crosses, but cook it and it still tastes like ...chicken. Mac Chicken : No reasonable chicken owner would want a chicken to cross the road, so there's no way to tell it to. Bill Gates : I have just released the new Chicken 2000, which will both cross roads AND balance your checkbook, although dividing 3 by 2 will get you 1.4999999999. Microsoft Chicken (TM) : It's already on both sides of the road. And it just bought the road. 51 REM I still need those variables! 60 RIMSHOT$="Ba Dam Ta TSSSH!" C Chicken : It crosses the road without looking both ways. 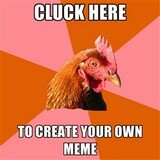 C++ Chicken : The chicken wouldn't have to cross the road, you'd simply refer to him on the other side. OOP Chicken : It doesn't need to cross the road, it just sends a message. Delphi Chicken : The chicken is dragged across the road and dropped on the other side. Web Chicken : Jumps out onto the road, turns right, and just keeps on running. Gopher Chicken : Tried to run, but got flattened by the Web chicken. Lotus Chicken : Don't you *dare* try to cross the road the same way we do!